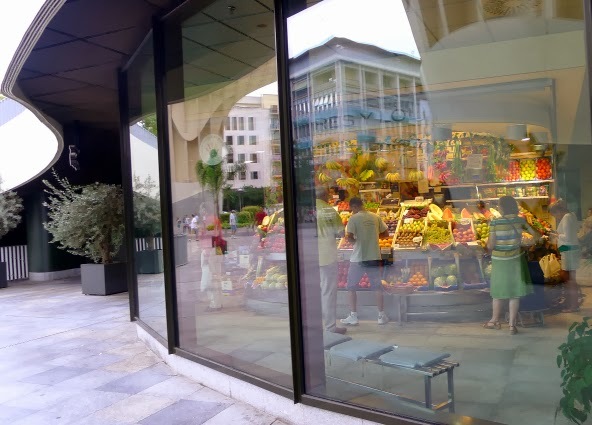 Entrance to the market in the plaza of the "Setas." 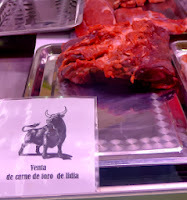 This week, more from my trip to Sevilla, a visit to a mercado de abastos, a daily food market. 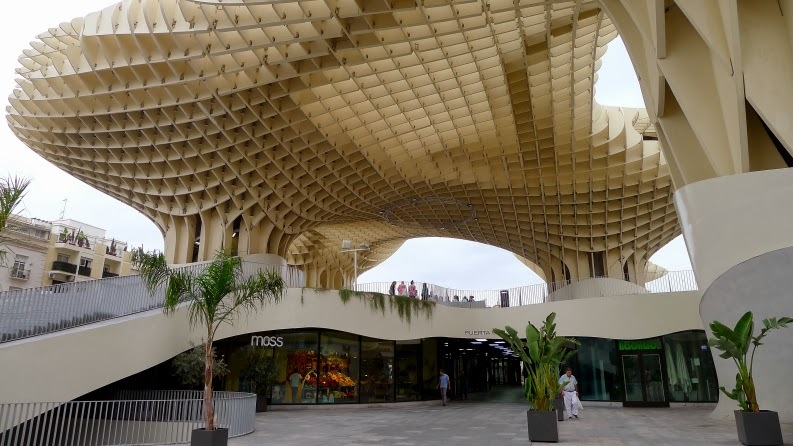 Just a few steps from the hotel where I was staying was the Plaza de la Encarnación and there I discovered an astonishing structure, Metropol-Parasol, popularly known as Las Setas de la Encarnación, the “mushrooms” of Encarnación Plaza. Tucked under the mushroom caps is a modern market. Designed by German architect, Jürgen Mayer, Metropol-Parasol was completed in 2011. The six parasols, or “toadstools,” are made of wood with poured concrete columns. The highest point soars more than 26 meters. Below street level—where there should have been a parking garage—is an archeological museum. That’s because, when excavating for the garage, important Roman ruins were discovered. Some of the mosaics can be seen through a glass floor in the plaza. The market opens at street level. Above is an open air plaza mayor and at the very top, a skywalk, with amazing views of Sevilla. I was still a train ride away from home, on a hot afternoon, so my market shopping was, unfortunately, limited. 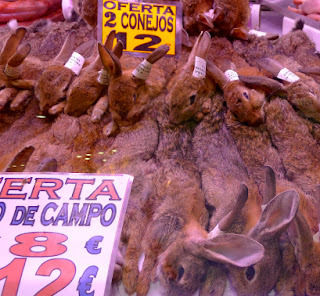 Here are some of what I found in the Las Setas market. A great season for fresh produce--end of summer means great tomatoes, melons and grapes but approach of fall brings new cabbages, carrots, beets and greens. In Sevilla, I saw purple broccoli, a vegetable I have never tried. Great selection of fresh fish and shellfish. 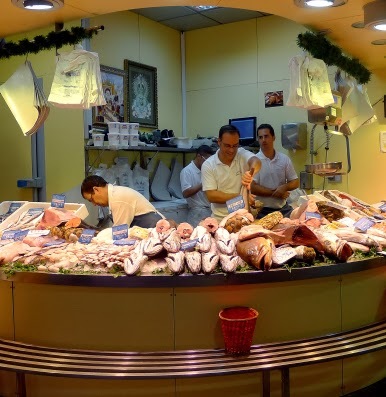 The selection of fish and shellfish in Sevilla markets is different from what I find on the Costa del Sol. 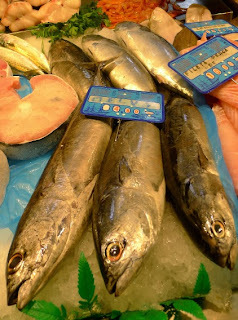 Here, two standouts are melva, frigate mackerel, a relative to tuna, and corvina, a large fish somewhat like sea bass. My seafood Guide to the Seafood of Spain and Portugal, by Alan Davidson (Santana Books) translates this as "meagre," but I think I've seen it called "corvina" in English. 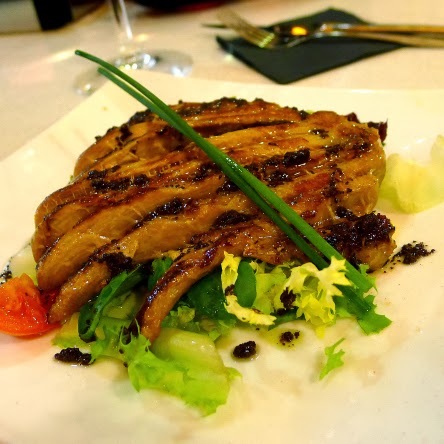 The meaty frigate mackerel appeared en escabeche in Sevilla tapa bars. 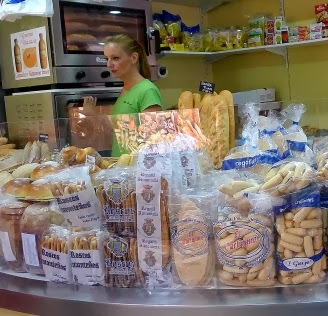 Fresh bread plus breadsticks and a variety of crackers. This butcher had everything lamb. 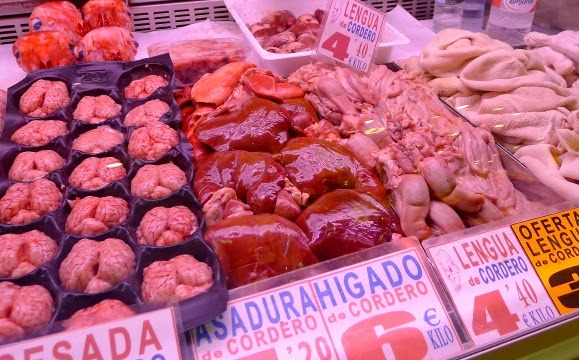 From the left, brains, liver, tongues, tripe, and at the back, lambs's heads and sweetbreads. After savoring sweetbreads at a Sevilla tapas bar, I really wanted to buy some. The butcher also was selling two legs of baby lamb for €14. "We're outta here, guys." 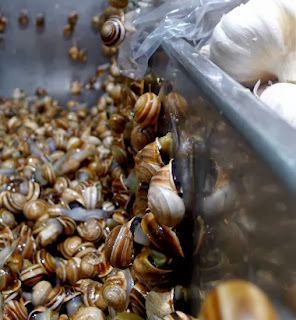 These snails high-tail it out of a bin, heading for the garlic. These are called cabrillas. 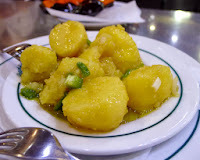 Cooked in a spicy sauce, they are favorite tapa bar fare in Sevilla. 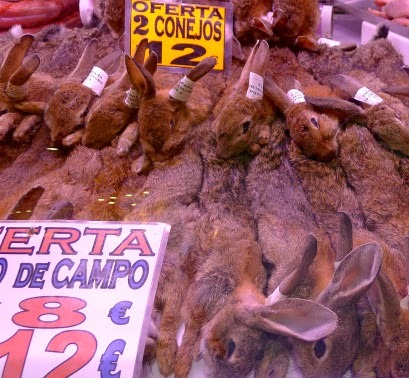 Farm-raised rabbits, ready for skinning. Sevilla is famous for its olives, manzanilla and gordal, prepared with many different seasonings. Also, capers and, pictured in the center above, caper berries. Chumbo vendor peeling fruit on the market plaza. 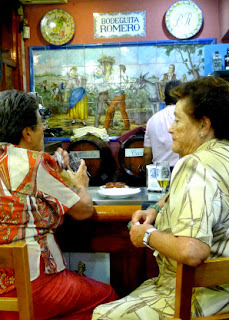 From hot Sevilla streets, into the cool interior of Bar Las Teresas. 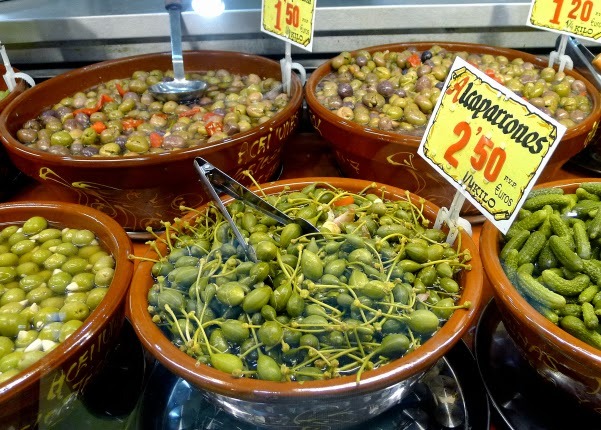 Within minutes, we have copas of chilled white wine, a plate of sliced ham and a bowl of Sevilla olives. I have arrived. 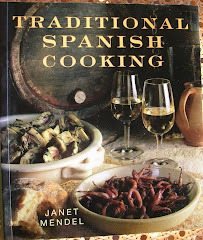 I’m about to begin a three-day intensive, immersion course in ANDALUSIAN TAPAS. By day, I’m taking in tastes and insights at Andalucía Sabor, a food fair and gastronomy conference featuring Andalusia’s best chefs. Theme this year: La Tapa. Tradición e Innovación en la Cocina Andaluza (The Tapa—Tradition and Innovation in Andalusian Cuisine). Bar Las Teresas is tucked in a side street (C/Santa Teresa 2), right in the Barrio Santa Cruz, Sevilla’s tourist heartland. Shawn used to live in this barrio, very near the big cathedral plaza, where she could see the Giralda from her balcony. “I still feel at home in this bar,” says Shawn. 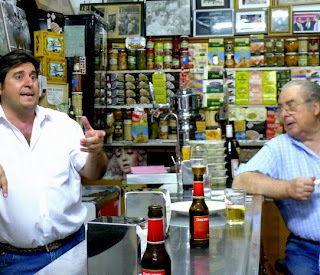 Back on the street, we make a stop at one of my old favorites, Bar Modesto, (C/Cano y Cueto, 5) (I love their chocos con habas, cuttlefish with fava beans in inky sauce), then continue to nearby Vinería San Telmo (Paseo Catalina de Ribera, 4), a modern wine bar run by an Argentine, Juan Manuel Tarquini. With Shawn at Vinería San Telmo. Shawn and I share tapas here—morcilla de Burgos (blood sausage flecked with rice—Shawn named her kitten “Morcilla de Burgos” for its coloring) in a smooth red pepper sauce and grilled pluma, a cut of ibérico pork, with yucca chips. We chat with Juan, take photos of each other and tweet them. 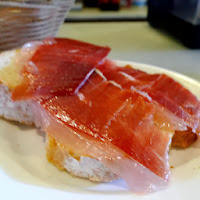 Shawn, a Twitter master (@SevillaTapas), shares her every tapa bite on Twitter. She opened an account for me (@Janet_Mendel), but without a smartphone, tweeting while out and about is limited. Mid-September and it’s still hot in Sevilla, so sipping chilled white wine is a pleasure. The Vinería offers an astonishing selection of wines by the glass, including Shawn’s choice, Botani, a fresh and floral white made in Málaga (http://www.jorgeordonez.es/nuestros-vinos/botani/ ). It’s a Sunday evening, and the streets are pretty quiet in Sevilla. Nevertheless, folks are out for a stroll, a copa and a tapa. The following evening, an ordinary Monday, the bars and cafés are really buzzing. Shawn takes me first to an abacería, a small grocer’s shop specializing in cheeses, cured meats and canned foods. Bar at abacería Casa Moreno. I ask Shawn how she organizes her tapas tours. “Depends on the people and how long they are staying,” she replies. 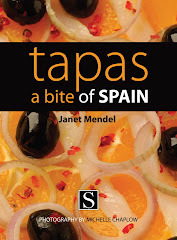 She recommends at least a three-night stay in Sevilla, with the tapas tour on the first night. Salpicón with shellfish and avocado, Enrique Becerra. At our next stop, seated at the bar at La Azotea (C/Zaragoza 5) we share a single tapa, a plate of soy-marinated ventresca, tuna belly. It costs only €4 and is a generous serving, absolutely delicious. A basket of bread comes free at the bar, but costs additional if you sit at a table. This is one of Shawn’s rants—the odious bread fee that some bars tack on. Her take is that bread is essential with tapas and should always be served. Bars should factor in the cost and up the price of the tapa, rather than charge additional for bread. Shawn charges an all-inclusive price per person for the tour—three bars, two drinks and two tapas in each (consult Shawn for prices), but can customize tours to suit clients. 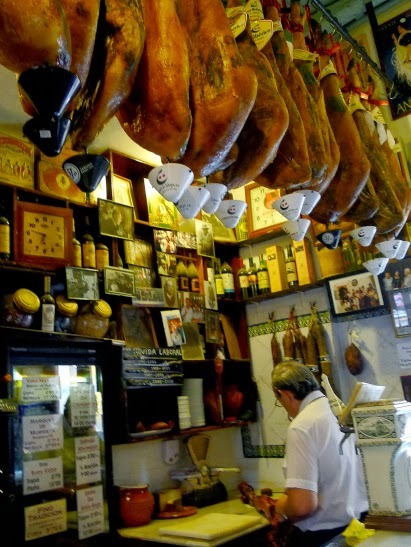 Specialty tours include market tour, flamenco and tapas, Sherry tasting. The next day we get back from the conference center in time for a late tapas lunch at El Rinconcillo, not far from the neighborhood where Shawn lives. 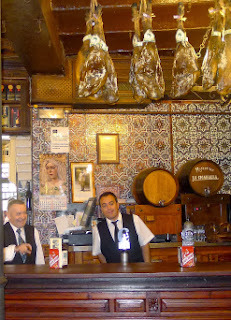 El Rinconcillo, founded in 1670, claims to be Sevilla’s oldest tapas bar. Colorful Sevilla tiles cover the facade and interior walls. Hams hang from the rafters. The barman chalks your bill on the wooden bar. Fried hake at El Rinconcillo. The espinacas con garbanzos, spinach and chickpeas, are classic—plenty of garlic and cumin. The batter-fried hake is crisp on the outside, flaky and moist within. A small heap of cole slaw is the perfect garnish. 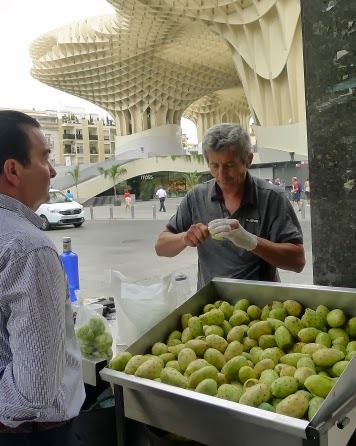 Slaw, Sevilla style, is made with lightly cooked cabbage dressed with olive oil and vinegar, no mayo. It's still crunchy, but not raw. Elsewhere, I've had it garnished with pomegranate seeds. 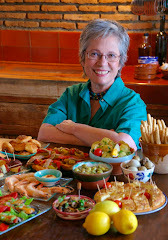 Can you make a meal on just tapas? Absolutely. In Sevilla, the portions are generous and they come with bread and/or bread sticks. Not quite enough to fill you up? Have another tapa. Priced from €3 to €5, tapas add up to a bargain meal. This is different from where I live, on the Costa del Sol (Málaga), where a tapa might cost less, but is really just a bite. You would have to order a media ración, half-plate, or ración, full plate, to get the same portion size. I have some leisure time to do some shopping (Zara Home, El Corte Inglés, are near where I’m staying) and enjoy a coffee in a café in the plaza before time to join Shawn for our last round of tapas. We head straight for what is, possibly, her favorite tapas bar. She doesn't actually claim a favorite. But, at Bodeguita Romero (C/Harinas 10) she feels at home. She knows everybody by name and they know her. And, the tapas are, arguably, the best in Sevilla. Along with our drinks order (yes, we are still drinking white wine) comes a tapa of a house specialty, papas aliñadas, potatoes with a simple oil-vinegar-parsley dressing, that Pedro Romero, third-generation to run the bar, makes daily. For something so simple, it is unbelievably good. The best pringá at Bodeguita Romero. “Here,” declares Shawn, “is the best pringá.” Pringá is leftovers, the pork fat, meat and sausages from a midday cocido, a one-pot-meal. They are mashed or chopped together and spread on a small toasted bun. The version at Bodeguita Romero is, as advertised, spectacular. It’s chunky, instead of a paste, and has more morcilla and little chorizo, which gives it a spicier flavor. Love it. 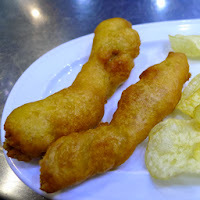 I am wanting a traditional Sevilla tapa of pavía, bacalao (salt cod) fried in a special batter. This version is spot-on. I ask Angela, Pedro’s wife, how she makes it. She says the batter has levadura Royal—baking powder. 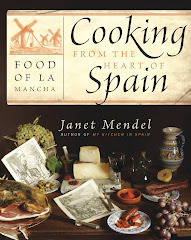 Other versions, including the recipe in my book, Tapas—A Bite of Spain, call for yeast. Two señoras at Bodeguita Romero. Our other tapa, carillada, pork cheeks, is one of those deeply satisfying dishes, “like your grandmother made,” says Shawn. I’ll have to go back to ask Angela for her recipe. 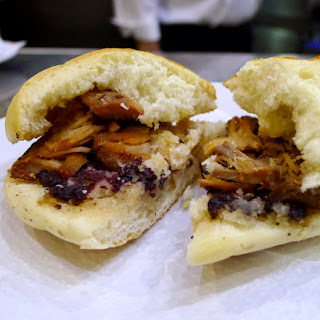 Wending our way back to our home barrio, we stop at another trendy new tapas bar, La Brunilda (C/Galera 5; Arenal). Shawn has got to have her fix—a super-umami burger. She calls it “crack burger” because it’s so addictive. Juicy beef, a soy mayo, bun—hey, is this Sevilla? Are we still talking about tapas? Yes, indeed. tapas are open-ended, always expanding. I think I’m ready for the graduate seminar. 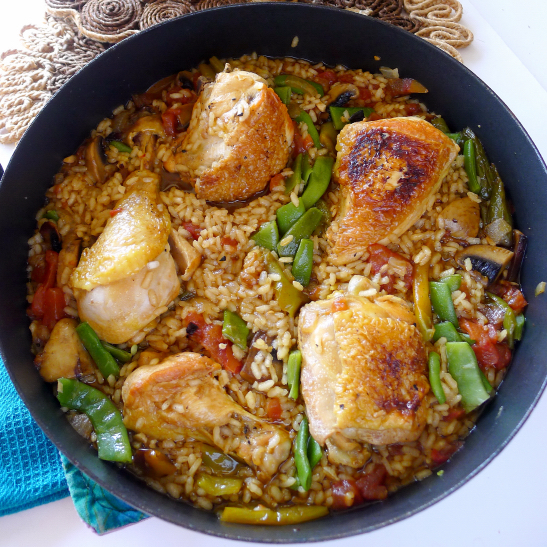 Arroz con pollo--rice with chicken--an easy dish. Do you have a favorite go-to dish, one that you can whip up without too much planning and feel good serving to guests? For me, that dish is arroz con pollo, rice with chicken. Like paella, it is generous and festive. Everything cooks in one pan, so it’s an easy dish for entertaining. But, unlike paella, it requires little prepping. No shrimp to peel, clams or mussels to steam open, squid to prepare. 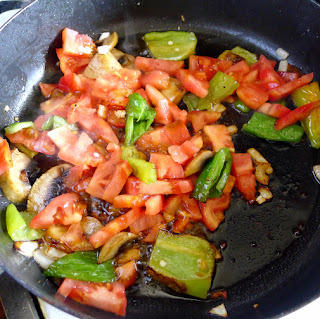 Sofrito--garlic, onions, peppers, tomatoes and mushrooms. Like paella, this rice dish starts with an easy sofrito of onions, garlic, peppers and tomatoes to create the flavor. You brown the chicken pieces, add stock or water, then the rice. 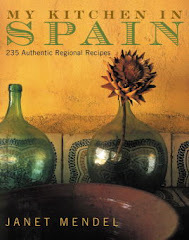 Unlike paella, this dish can be cooked in almost any pan—an earthenware cazuela; a deep, lidded casserole; a big skillet; a paella pan or a perol, a deep two-handled frying pan. 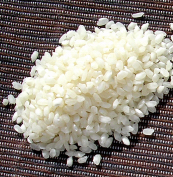 The proportion of liquid to rice is slightly more than double, so it isn’t a “dry” rice, like paella, but meloso, or slightly juicy. That’s pretty forgiving—but you still have to take care not to overcook the rice. And, unlike risotto, the rice is not stirred while cooking. 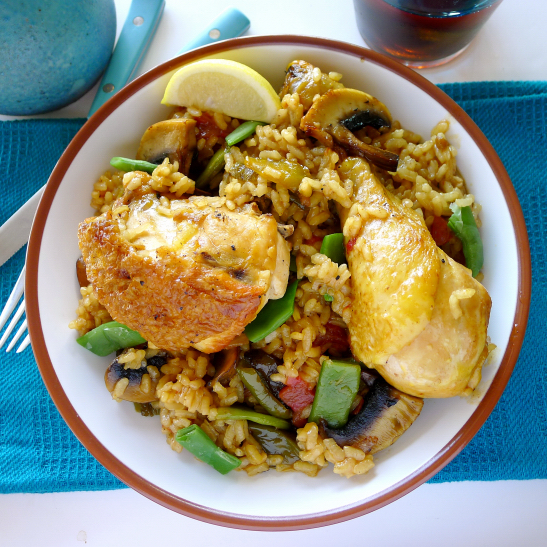 Arroz con pollo is a dish easily stretched to feed last-minute guests. Just cut the chicken into smaller pieces. This is rice with chicken, after all, not chicken with rice! I like to use one chicken piece per serving (legs, thighs, wings, breast cut in quarters). I use the backs and wing tips to make a quick and easy stock. But, even this is not necessary. You can use canned low-sodium chicken broth or—water! Arroz con pollo is a dish that, except for fresh chicken, can usually be put together with ingredients in the pantry or freezer. In the spring, fresh habas (fava beans), peas, artichokes and asparagus are perfect additions. In this season, I’m using green beans from the garden. Zucchini, mushrooms, canned butter beans are other options. 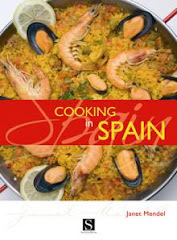 Use Spanish medium-short-grained “round” paella rice for this recipe. If you can get it, the bomba variety is best, because it does not swell up and “flower” when cooked with lots of liquid. In Latin-America they make arroz con pollo with long-grain rice. It’s good, but the rice doesn’t soak up the flavors the way it does with Spanish rice. Saffron is optional in this rice dish. Use it if you’ve got it. In any case, use enough sweet pimentón (paprika, not smoked) to add a slight ruddy color to the rice. I like to add a pinch of smoked pimentón as well. It gives a hint of sausage to the rice. Flavorful rice, chicken and vegetables. Sprinkle the chicken pieces with salt and pepper and allow to stand for 30 minutes. Heat the oil in a large cazuela or skillet. Brown the chicken pieces in the oil, turning to brown all sides. Remove the chicken as it is browned. Sauté the garlic, peppers and onions 5 minutes. Add the tomatoes and sauté on high heat for 2 minutes. If using fresh peas, fava beans and green beans, add them now. Add 1 cup of the broth and 1 teaspoon salt. Return the chicken pieces to the pan. Bring to a boil, then reduce heat so the liquid bubbles gently. Cover the pan and cook 15 minutes. In a mortar, crush the saffron, if using, to a powder. Mix it with a little of the remaining broth or water. Add the saffron water to the pan with the pepper, cloves, cumin, pimentón, cayenne and bay leaf. Turn the chicken pieces and add the potatoes, if using. Cover and cook 5 minutes more. Add the remaining 4 cups of broth. Bring to a boil and stir in the rice. (If using frozen peas, fava beans, and green beans, add them now.) Taste for salt and add additional if necessary. Reduce heat so liquid bubbles gently. Cover the pan and cook 15 to 17 minutes, stirring only once during this time. The rice should be al dente. Not all of the liquid will be absorbed. Remove pan from the heat and let stand, covered, 10 minutes before serving. Happy New Year, everybody! It’s Rosh Hashana, the Jewish New Year (the year is 5774). This holiday came very early this year. It’s still summery where I live in southern Spain. No pomegranates or quinces, fruits so typical of this holiday, have come to market yet. We are still basking in late-summer fruits—luscious ripe figs and grapes. 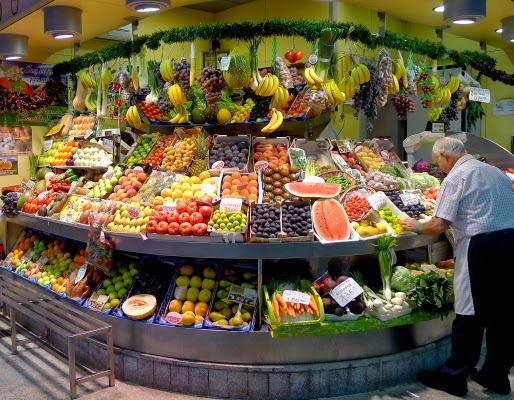 In Spain, the fruit most associated with New Year’s—the New Year that turns on January 1—is the grape. Twelve grapes, actually, one consumed on each strike of the midnight bells to assure 12 months of good fortune in the coming year. So, melding my customs a bit, I am serving grapes for the Jewish New Year. Black grapes make a leafy arbor on my patio. The green ones, above, tumble over the sides of a terraced hillside. I'm told that this hillside was once completely planted in vines--before the phylloxera blight of the late 1800s. Spain has the most extensive vineyards on earth, most of them dedicated to the production of wine grapes. There are also large plantations of table grapes. The muscatel, in particular, is especially esteemed. Intensely sweet, these grapes are also dried to become famous Málaga raisins, pasas. When grapes are pressed, they produce mosto—grape juice or must. Left to ferment, it becomes wine. The mosto can also be pasteurized to be served as a non-alcoholic beverage. Or it can be slowly reduced to a thick grape molasses, called arrope. Fruits and even vegetables are preserved in this intensely sweet syrup (see a recipe for pumpkin in arrope). Chicken simmers in spiced grape juice, a lovely holiday meal. Where there are vineyards, there will be food cooked in the juice of the grape. This chicken dish is adapted from a renaissance recipe in a little book, Carlos V a la Mesa, by L. Jacinto García, describing culinary trends in the 1500s. 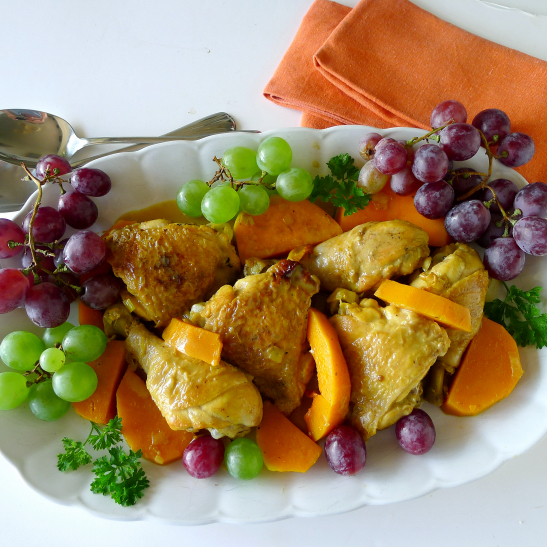 The sweetness of the grapes and the aromatic spices make this dish especially appropriate for Rosh Hashanah. Perhaps it was served in this way in Toledo, pre-1492. 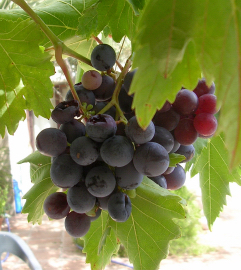 To make your own grape juice: Choose any variety of grape—red, black, green, gold—that tastes good. 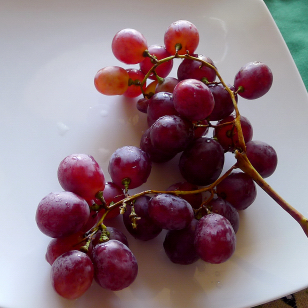 Remove stems and wash the grapes. Use a food mill, processor or blender to crush the grapes. Sieve the pulp, saving the juice and discarding pips and skins. 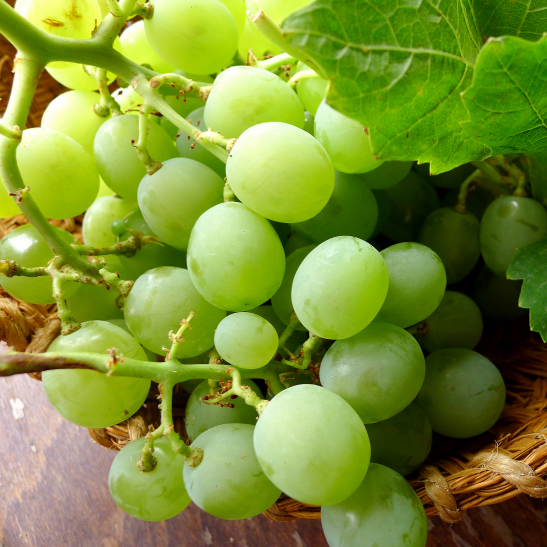 You will need about ½ pound of grapes to make ¾ cup of strained juice. Add lemon juice to the fresh grape juice. Use the juice within a few hours or else bring it to a boil, cool and refrigerate to prevent it from beginning to ferment. Unsweetened bottled grape juice can be substituted for fresh grape juice in this recipe. Heat the oil in a large skillet or sauté pan and brown the chicken pieces on medium-high heat, about 5 minutes per side. Remove them and reserve. Add the leek and sauté until softened, 3 minutes. Combine the crushed saffron with hot water and allow to infuse at least 5 minutes. In a small bowl combine the ginger, nutmeg, cinnamon, coriander, cloves, ¼ teaspoon ground black pepper, and ½ teaspoon salt. Return the chicken to the pan with the leeks. Add the grape juice, lemon juice, saffron water, and spices. Bring to a boil, then cover and simmer the chicken for 20 minutes. Turn the chicken pieces. Add the squash or carrots, if using. Cook until chicken is very tender, 20 to 30 minutes longer. Remove chicken to a serving platter and keep it warm. Beat the egg yolks in a bowl with some of the liquid from the pan. Stir the yolks into the pan and cook without boiling, uncovered, until the sauce is slightly thickened, 5 minutes. Spoon the sauce over the chicken. Garnish with grapes and sprigs of parsley. 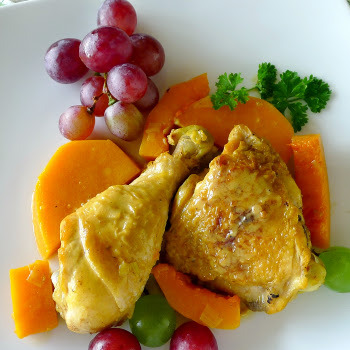 Chicken with grapes and butternut squash.